In his otherwise extensive review, chris_walker says he's not surprise that this card didn't get a review for so long. I strongly disagree, and I'm surprise it didn't get any, since from the 3 HB identities from Creation & Control, Cerebral Imaging is the only one that have seen some success at a time. It is first notable to be arguably the weirdest Corp identity of the game. And when it was released, nobody gave a serious look at this one. But then after, a few cards helped it, namely Green and Blue Level Clearance. For CI, getting both draw and money is a good deal. Out of faction, Celebrity Gift has been a good help too. Also Restructure as neutral. then score your last agenda with the same shenanigan. Reclaim your Shipment, or your Biotics if you lose a Committee. flatline the Runner with a SEA Source/Scorched/Scorched/Efficiency counters/Recamation Order/Scorched(/Scorched) if you must. Heck, there's stories of Runner dying while sporting 2 Plascrete Carapaces and a full hand. That’s simple, for a short time, before NEH was released, the main meat-kill archetype was this. In case you wonder why CI is more efficient than other identities for such a plan, it’s because keeping your hand growing without bothering for remote server really helps to assemble the pieces of otherwise quite clanky combos. That is, CI is great for combo deck. Some Power Shutdown + Accelerated Beta Test deck have seen come various success. Then it has fallen out of flavor but in a faction that suffers to be trusted by one freaking good identity with others desperately running after, CI, not despite but thanks to its weirdness, has shown some success. I hope it will again. 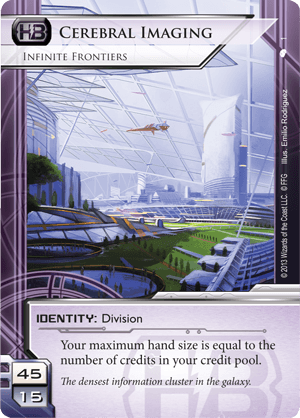 Functionally similar to the Runner resource Theophilius Bagbiter, this ID will bestow serious bragging rights to any player who is able to use it successfully. See Scorched Imaging decklist by PeekaySK as a masterful example of recursion & Scorch that was used to successfully overcome the obstacles that Cerebral Imaging: Infinite Frontiers puts up. IQ is a nice for for this ID, get it installed early when HQ hand size is small/empty then they can become very touch to get through later in the game. Ashigaru another ice that could be quite wicket with this ID since it's based on hand size. Astounding financial discipline - A player that Dave Ramsey would be proud of. Hide at bottom strategy: With Cerebral Imaging: Infinite Frontiers ID & Daily Business Show installed and a slow draw strategy along with a protected R&D it may be possible to reserve a number of agendas keeping them out of HQ. With fewer or possibly no agendas in HQ, this ID is isn't as risky and HQ size could be allowed to grow a bit more allowing more options. Finally Shannon Claire could be used to undo the madness when the corp is ready to score. Scorched Earth & SEA Source etc could combo with this ID to tag & bag the runner since the corp will inevitably always have a lot of in reserve that could be used in one big push to flat-line the runner. If you have an agenda or two in your 35 card HQ, they are probably pretty safe, you may even be begging the runner to run on HQ, anything to draw attention away from the dwindling cards in your R&D. If through some miracle you are able to pull off a win in a competitive tourney with this ID people will high-five you in the comments below this review! As you spend turn after turn collecting income and not playing cards from your HQ, your opponent will rue the day he/she sat down to play with you. Judicious use of financial attack cards such as Account Siphon or Vamp etc could be devastating if the runner is able to time things well. With your economy constantly being locked up, You risk being paralyzed from executing your strategy by facing sub-optimal choices in relation to the other cards in your HQ. There is good reason why this ID hasn't been reviewed on this site up to this point. Most popular player ID's provide a unique bonus to the player, with little to no side effects. This ID is the antithesis of most in that it provides a severe negative with little to no benefit. This ID really cannot stand on it's own, it really needs combo cards that work with hand size etc, otherwise corp players rarely benefit from larger hand sizes in the way that the runners do so bottom line: Play with critical combos otherwise this ID shines best when viewed as a handicap, where an experience corp player can use this ID to help even the playing-field when playing against a novice player.